I never fashioned myself a service dog. Oh, I enjoy helping people as much as the next dog, but I clearly don’t have the temperament to devote every waking moment to assisting someone else. I mean, I’m a nice guy but I’m not Mother Flaperesa. Two days of unlimited service and I’d need a padded dog house. And yet, Dad obviously thought I could play the part. We were all traveling in northern CA and stopped for the night at a nice place in Petaluma. Dad had checked the hotel’s website and found that they take dogs (mighty big of them). But when we arrived, Mom was checking their site again on her smart phone, and discovered that the hotel only takes very small dogs. Now, I’m no Marmaduke but I’m no Toto either. Dad was looking at me with a curious expression. I thought he was considering how he could shrink me, but he was pondering something even more harebrained. He explained to Mom and me that he was going to impersonate a sightless person and that I would be his guide dog. Mom calmly responded that she would take no part in this folly (or words to that effect), and I wanted to quickly side with Team Sanity, but had no choice. And so it was that Mom sat in the lobby and pretended not to know us. Dad (wearing shades) checked in with me on a figurative and literal short leash. The clerk asked Dad how he could possess a driver’s license if he couldn’t see. Dad mumbled something about a very recent health condition. After check-in, I thought I’d have some fun. So, when Dad inadvertently loosened my lead, I used my considerable strength to take him on a running, zig-zag tour of the lobby. As the clerk looked on, Dad was trying to give the appearance that he was in total control of his ‘guide dog’ while attempting to keep his arm in its socket. After a few minutes, I decided to give it a rest. The lobby looked like a hurricane had hit it. Dad, lying on the floor, had the appearance of a man who had been, well, dragged through a hotel lobby on his belly. I licked his face, which probably added insult to injury. Then he whispered in my ear, “Just wait ’til you need me to play along with one of your ideas!” I looked over at Mom. She had her face buried in a magazine, but her entire body was convulsing (she was either laughing or required immediate medical attention). So, as Dad ‘felt’ his way to the front desk to complain that the lobby did not conform to specifications for disabled persons (his audacity compensates for his absurdity), I went to check on Mom’s physical condition. Because I’m here to serve, to a limited extent, subject to my disposition and my definition of ‘serve’. 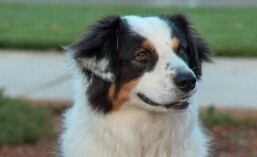 This entry was tagged aussie, australian shepherd, blog, dogs, guide dogs, humor, impaired. Bookmark the permalink.